Use these homework sheets to target carryover. Assign 24 different homework sheets. Send home the included parent letter, explaining the homework program. 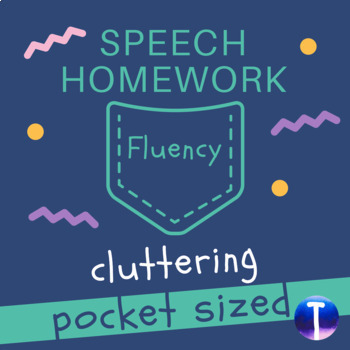 Use the included data sheet for therapy notes and keeping track of speech homework you've assigned. Type goals and student information into the form fields. Print it out and track data on goals and homework assigned. Download the data sheet separately here if you prefer to have a file containing the data sheet by itself. That way, you can save a copy for each student, with his or her info typed into the fields. Then when you add new goals, all you have to do is update the goals section and reprint the data sheet. 1. Send home the parent letter (included). 2. Write the child's name on the pocket sized homework sheet (included) and send it home. Make a quick note on your therapy notes template (included). 3. Put the completed homework sheets in a bucket or bag, and hold a raffle drawing (with prizes) once or twice a week, using the homework itself as the raffle ticket. What makes this homework different? It fits into any child's pocket. This means it's discreet for adolescent students. It also means it won't get left at school, in the child's desk. The directions are clear. The instructions are already written on each homework sheet, saving you time. The included parent letter explains who, what, when, where, and why. Students will want to do it. They will want to have their names in the raffle drawing. The prizes can be anything you want. The program is easy to use. The included therapy notes template is all that you need to keep track of what you assigned, so you can avoid repeating the same assignment. You don't need to worry about assigning the sheets in order. The materials focus on education and practice. 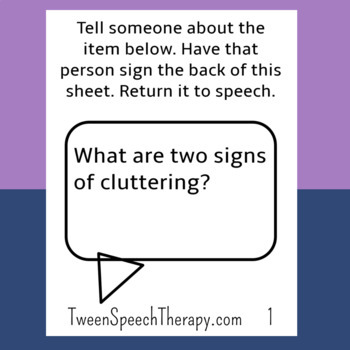 These materials provide practice in conversation, and they also require students to describe cluttering, deepening their understanding. Like saving money? These homework sheets are designed to be printed on a black and white printer. Read my blog post about cluttering! Also check out my other pocket sized homework.